The backbone of my morning and evening meditations and prayer has become the Anglican Book of Common Prayer. It has taken me a while to figure out how to use it (with a lot of help from a friend), and I’m still clumsily trying to make my way along, but it is an amazing book. It gives just the right amount of both freedom and structure to give me both guidance and excitement. I’m really enjoying it. Secondly, I am a relatively new member of a church that belongs to the Reformed Church in America. Both of these things has led me to encounter ancient church documents, creeds, and traditions I was never exposed to as a Bible Belt Southern Baptist. One of those newfound traditions that is really becoming a major part of my life is the Church Calendar. According to the calendar, we are currently in the season of Epiphany, where the church celebrates the travel of the Wise Men to see Jesus, therefore declaring him King and Lord among all the nations, and today is the Church Holy Day on which we celebrate Jesus’ presentation by His parents in the temple (forty days after Christmas) (Luke 2:22-40). As I went through the Daily Lectionary this morning, I found that focusing on this event and meditating on it bore some very real personal fruit that I wished to share. The first reading for this day was from Malachi 3:1-4. In it, God tells his people that he is sending a messenger (who would be John the Baptist) who would prepare the way for God to come to his people (in Christ). He says he “will suddenly come into his temple” (hinting at both his presentation in and judgement over the temple). Lastly, He says that “then the offering of Judah and Jerusalem will be pleasing to the Lord…”. Did you catch that? God himself promises to come to us and accomplish for us that which will then make our sacrifices actually pleasing to Him. He says He will do it. And He has. And that commissioning began at that temple presentation. But why? The next reading was from Hebrews 2:14-18. A very precious passage for me. My greatest fear is death. I know it’s absurd and theologically illogical, but there’s a part of me that (a) still clings to wanting to make a name for myself here in the old creation rather than seeking a world to come, and (b) struggles with doubt about life hereafter. This passage speaks of those who “through fear of death were subject to lifelong slavery” and how Christ became human and conquered death to deliver all those people form this slavery to that fear. It is precious to me. This passage talks about the mysterious union of God and man that took place within Christ–that same Christ which I am now mysteriously in union with as well. During Christmas, my church in Richmond was doing a sermon series called “Songs of the Story” going through each one of the songs that surrounded Jesus’ birth. The last sermon, given by Robert Greene, was one of those turning point messages in my life. It was covering the song of Simeon (traditionally called the nunc dimitis) that I just mentioned. After the sermon, the church usually puts up reflection questions for you to ponder before taking Communion. 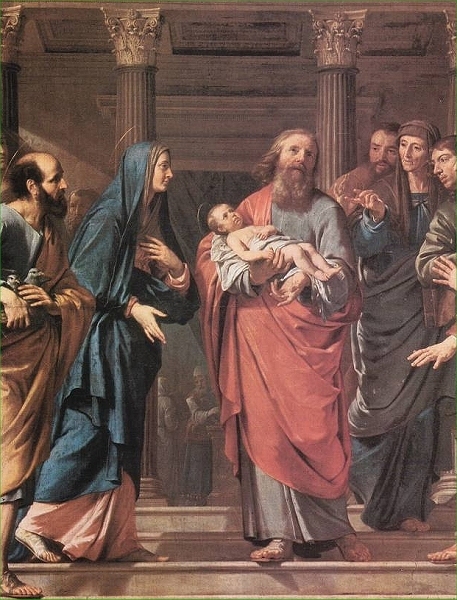 That particular week there was a question something along the lines of “We see what emotion was evoked within Simeon at seeing Jesus. What do you feel in the present of Jesus?” I realized then, perhaps for the first time, that the fundamental things I feel when I think about/experience Christ is an overwhelming sense of insecurity and “not being good enough”. That sermon/realization brought me into the spiritual season I’m currently in, where Christ is addressing the ways that I seek this security and affirmation from other people/places, and how my first reaction to every shortfall is to try better and just “will harder” so I might receive credit before God and then be accepted, then feel secure, then be able to rest. The meditation today reminded me of this, the process God has taken me in the past couple of months, and it showed me once more just how beautiful this whole Story of Redemption is. And God freely brought it about, that we might partake in His goodness and mercy. If Christ was presented at the temple, as this day celebrates, then in that is part of my hope that I will be taken into the scarred hands of Savior, my Lord, and presented to my Father above when he has established his new temple, namely the New Creation. This brings me joy, hope, humility, and rest. May it do the same for you. What does Jesus’ presentation at the temple say to you? I like your post. I am pretty new at this blogging thing, but I posted myself about the Feast of the Presentation. I was thinking earlier today about death, b/c I too read the readings (same as in the Roman Catholic tradition, we read these at Mass). I pondered this fear of death, and really came to see that death is ultimately what all of our fears are about. Think about it: the root of all of our concerns and worries ultimately is the struggle for survival. And yes, Christ has conquered death. We truly do not ever have to fear. But, what a long road it is from realizing this to living it.